Greeting! Long time, not talk. 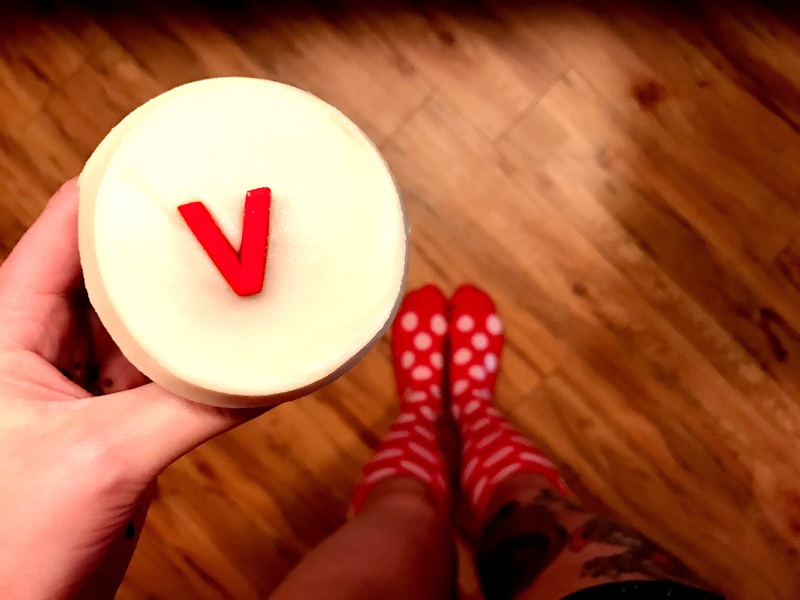 Well it is 2017 and I am vowing to keep up with the blog! Be on the look out for race reports, travel posts, product reviews and much much more. 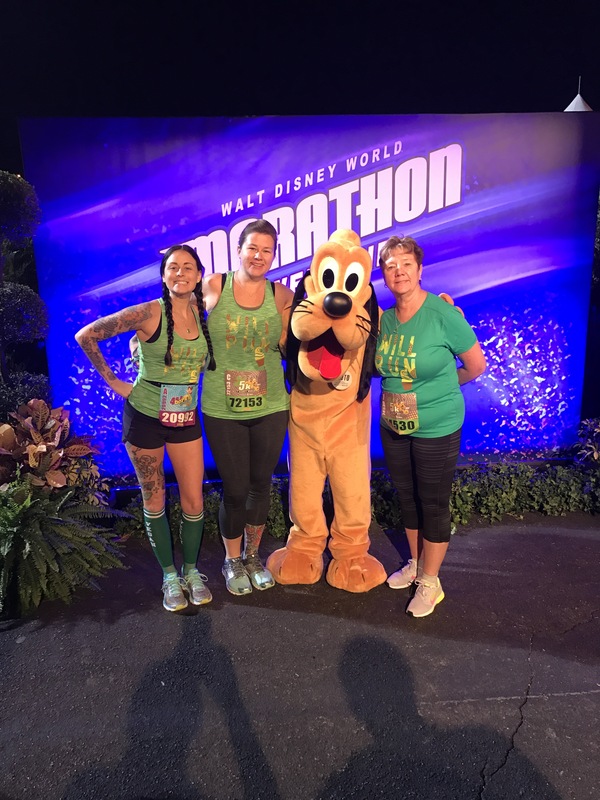 Lets begin with my most recent venture to Disney World to run the Dopey Challenge. For those of you who do not know, every January Disney World holds their annual marathon weekend. The weekend included a variety of race, a 5k, 10k, half marathon, marathon and kids fun races. 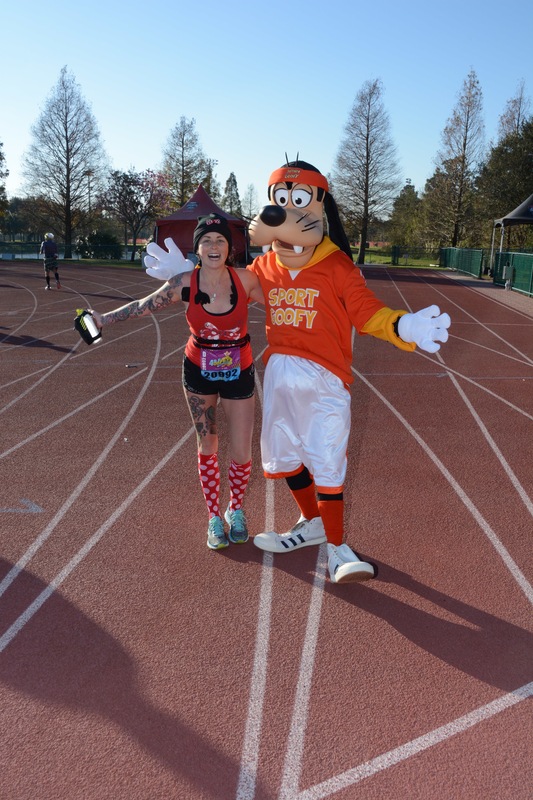 For the crazy runner, there is the Goofy Challenge which requires completing the half marathon and full marathon. 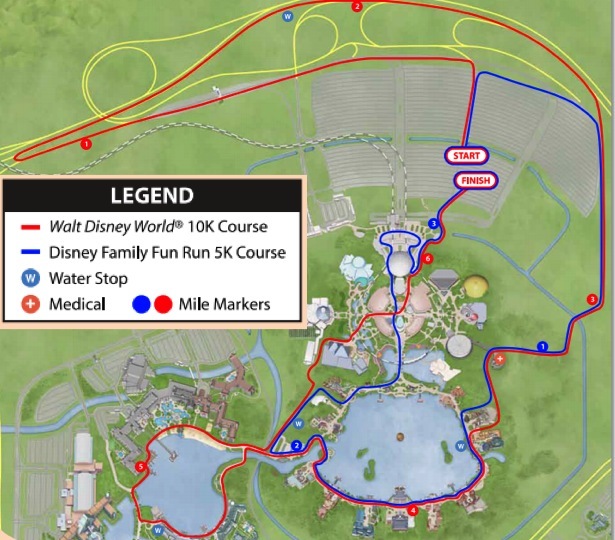 For the even crazier runner, there is the Dopey Challenge which requires completing the 5k, 10k, half marathon, and full marathon. That is four days in a row of running. 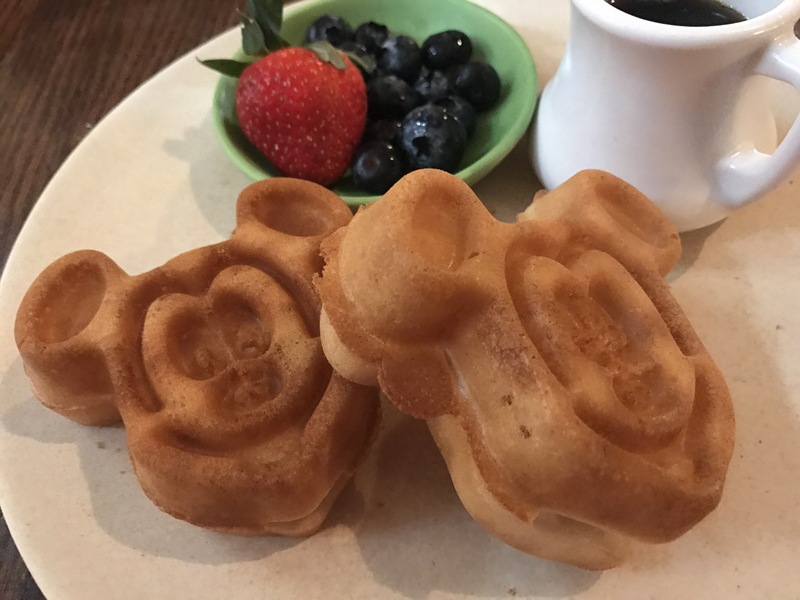 Of course, I made it my goal to do the Dopey… while eating my way through and going to the parks, not taking the running into consideration at all. The month prior to Dopey was spent in full on training mode. It was a test to get the mileage in, with not much speed work but it was exhausting. I had just finished training for my major race of the year, the Philadelphia Marathon (11/20/2016), took a few days off to recover, then was back to training once again. 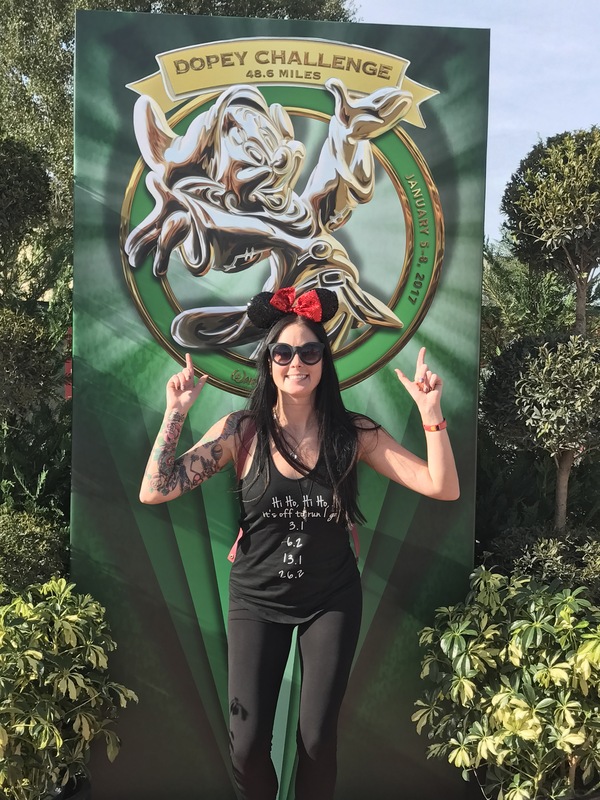 I spent the month of December glued to the runDisney website/social media and Dopey/runDisney groups on Facebook keeping my motivation up, as I moved drone-like through training. As the race/Disney trip got closer, the less I thought about the running, so much so that a friend asked me when my next marathon was and I said “September”, not even acknowledging that I would be running another one, IN JANUARY. The new year came and went and the next thing you know I was on an airplane to Orlando with my mother, Maureen, sister, Jamie, and friend, Natalie. We all had our own running feats to conquer. My mom was to complete her first 5k. Jamie was to complete her own challenge of sorts, the 5k, 10k and half marathon. Natalie was to complete the Goofy Challenge. We all had our own goals for each race, whether it was just finishing or making personal records. Additionally, we were not going to let the running get in the way of our Disney fun. We arrived around 9:30 am the Tuesday prior to race day, took the Magical Express to our “home” for the week, Old Key West then our girls trip began. 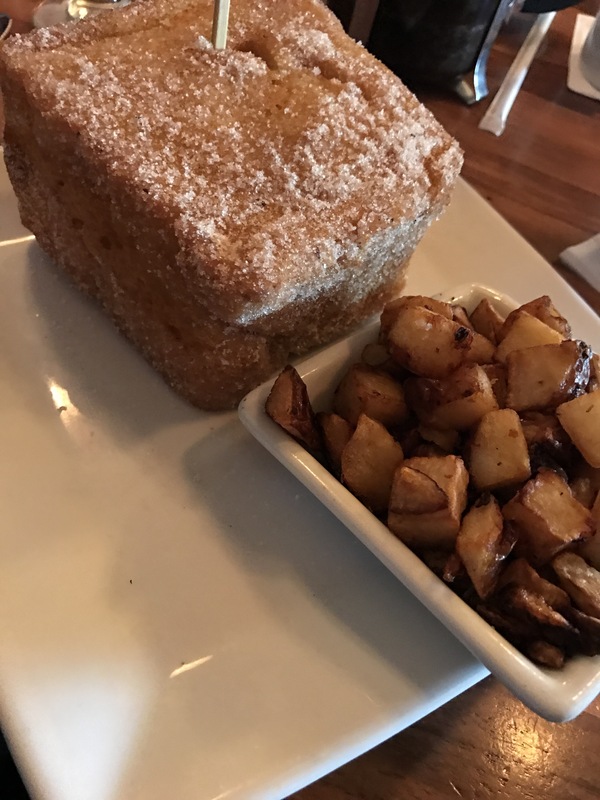 I am not going to mention any of the food I have previously had and reviewed unless there were changes since the last time. Links to my other Disney posts can be found at the end of this post. 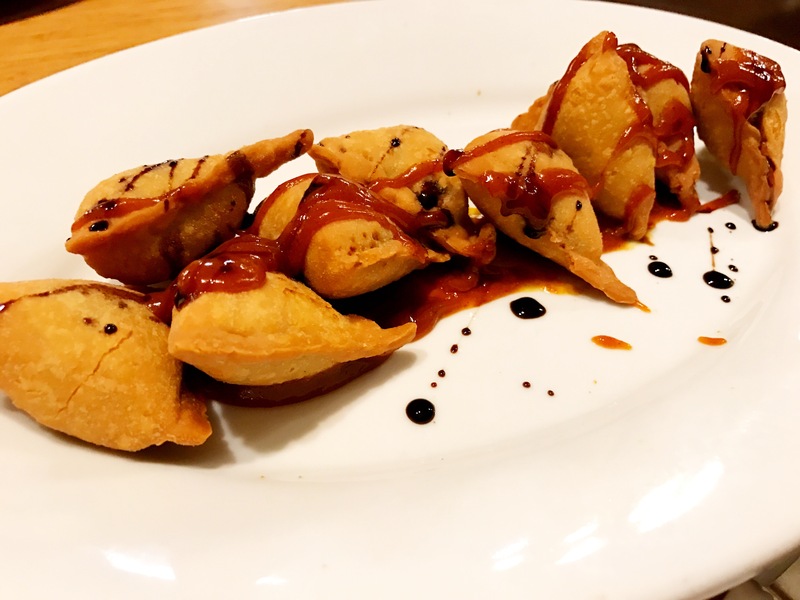 It is not a vegan trip to Disney World if you do not go to Trail’s End and dine with Chef TJ. Below our the dishes we split. We ate an early lunch to prepare our stomachs for the massive amount of food we knew we would be served. 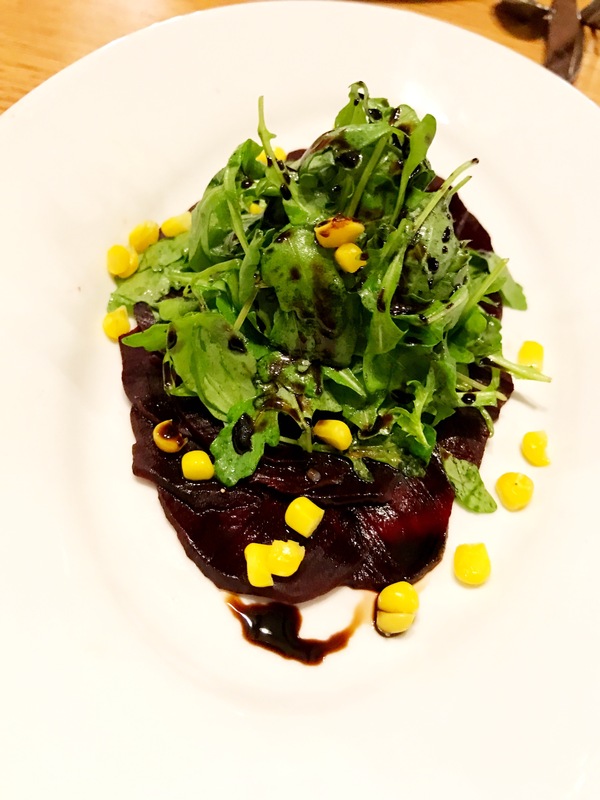 On top of the Chef TJ regulars, we were served a really yummy beet and arugula dish. 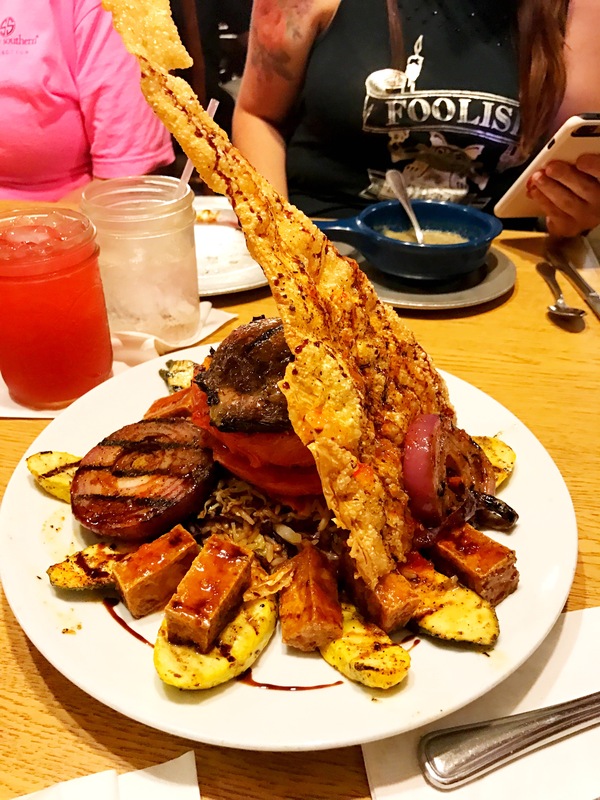 Meh, a vegan walks into a steak house.. we got what we expected… confusion as to why we were there. 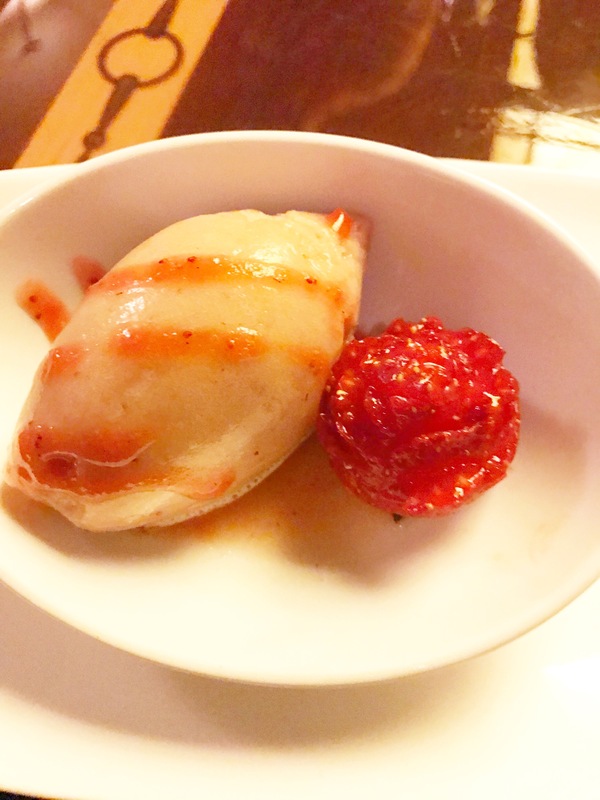 Upon booking this reservation, Le Cellier had a seemingly delicious Meyer Lemon Tofu dish. 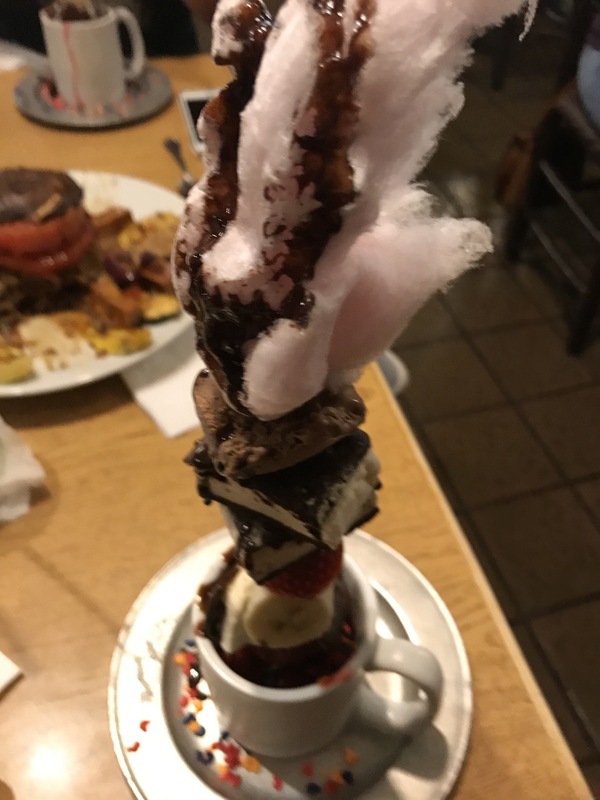 When we arrived, this dish did not exist. 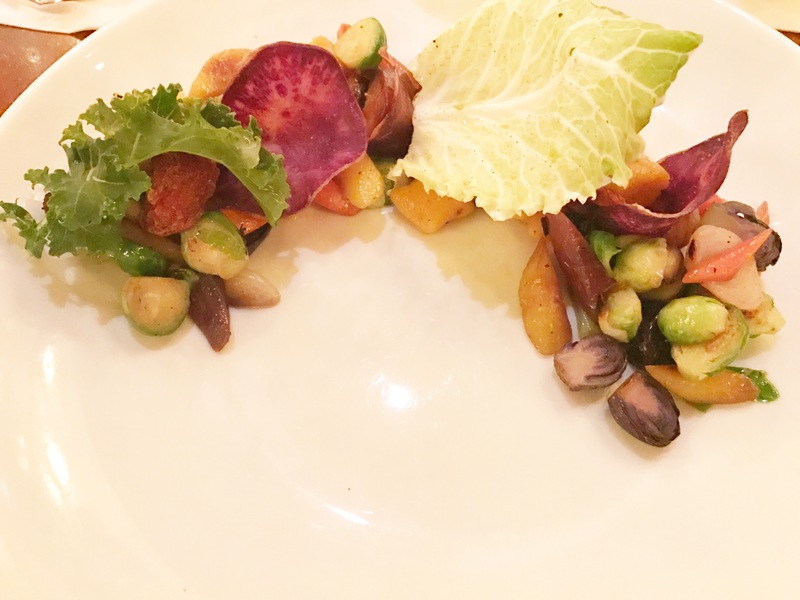 Instead a new “vegan friendly” dish was on the menu, Root Vegetable Gnocchi. It was okay, just not the Meyer Lemon Tofu dish I was dreaming of. 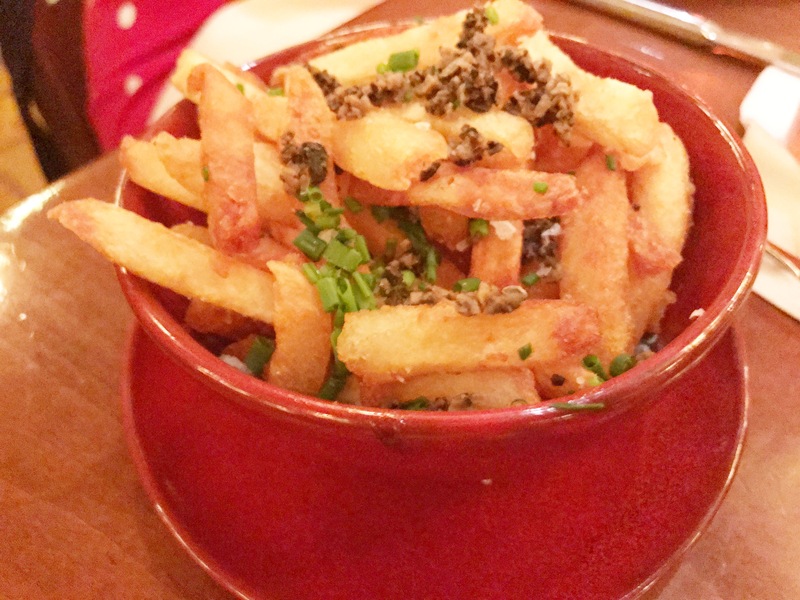 In addition the veganizing of the Root Vegetable Gnocchi, we enjoyed their bread selection (with Earth Balance upon request) and Truffle Fries sans cheese. 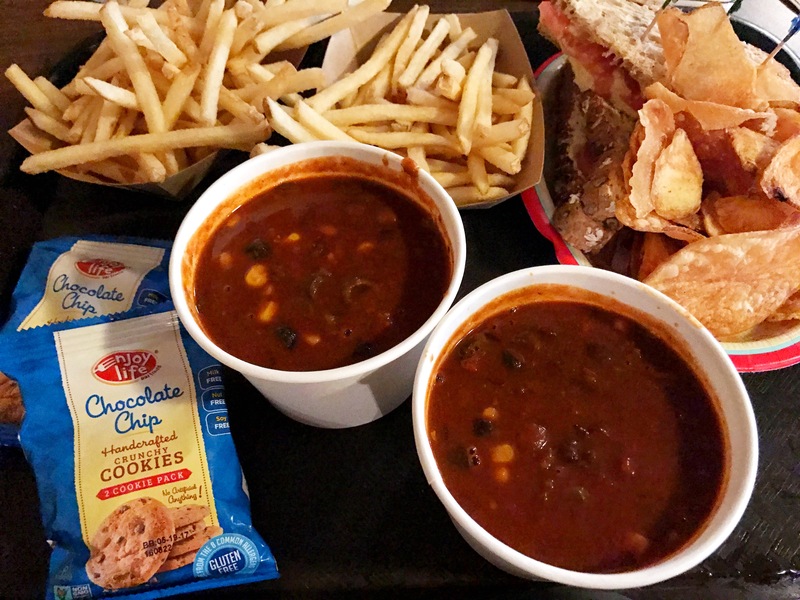 Animal Kingdom’s Mr. Kamal’s food stand may hold some of my favorite snacks in all the parks. 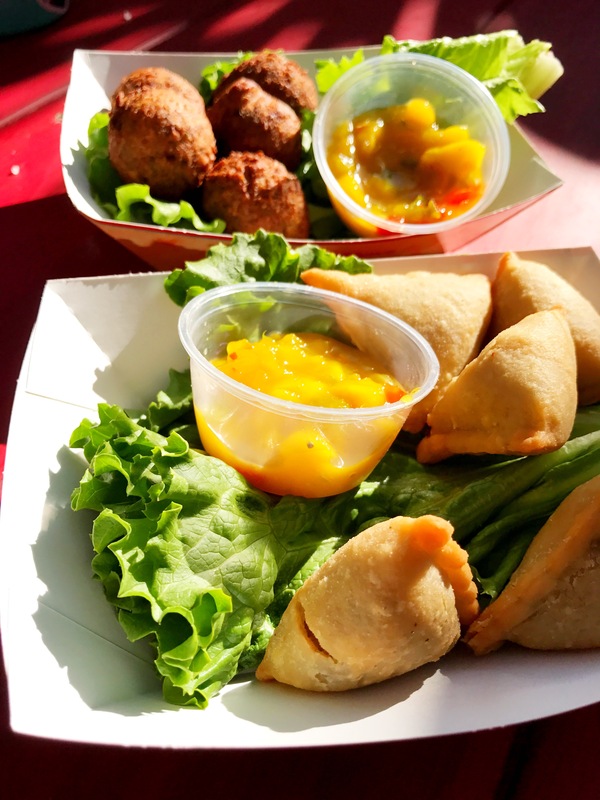 We enjoyed their samosas and falafel balls as an afternoon snack. 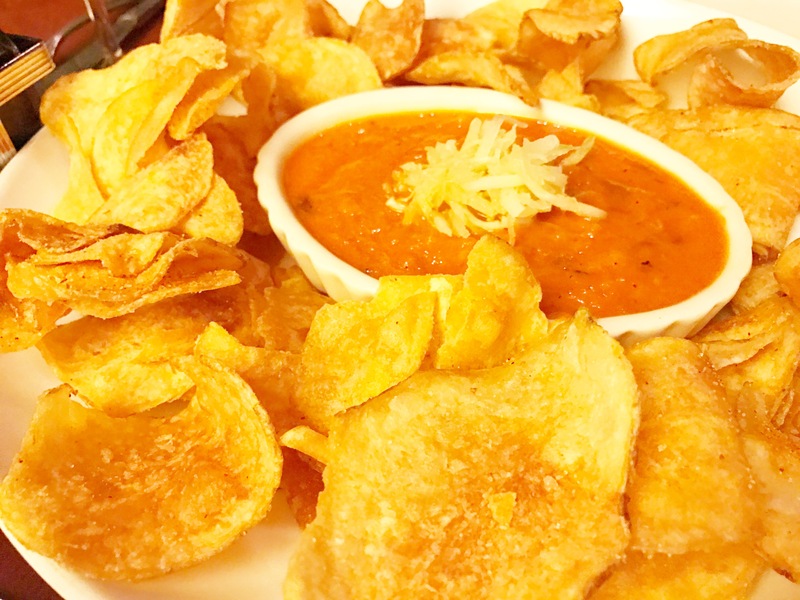 Both very tasty when paired with the mango chutney. 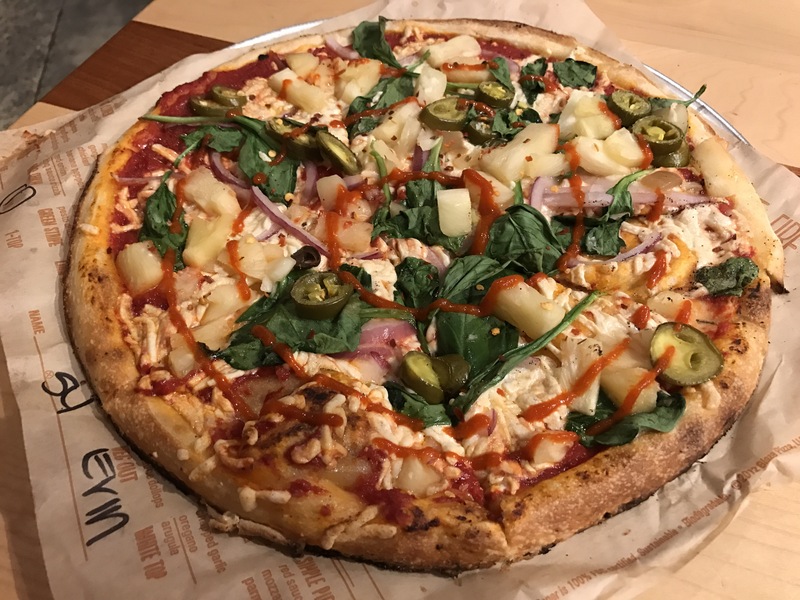 The pizza chain, Blaze, now located at Disney Springs is pretty high on my recommendation list. 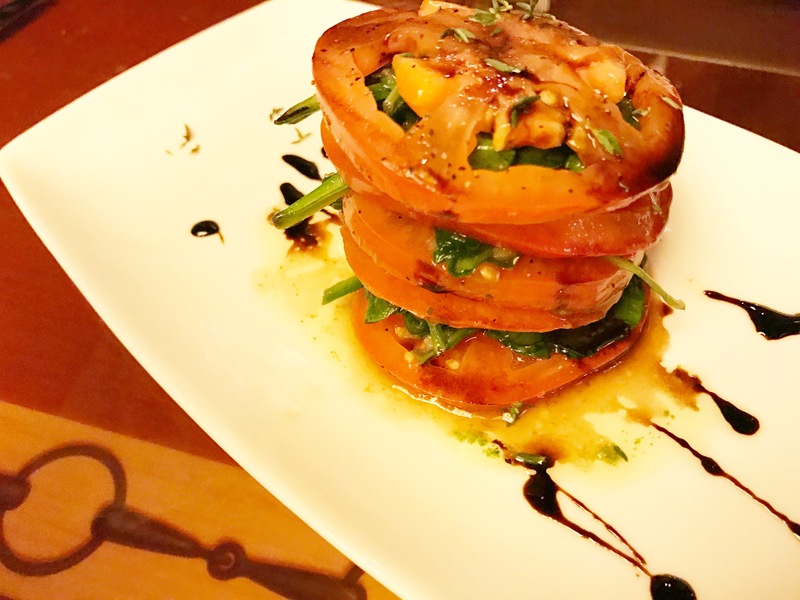 With several vegan topping and staff that will change their gloves to serve you to avoid cross contamination, Blaze gets a five star review. 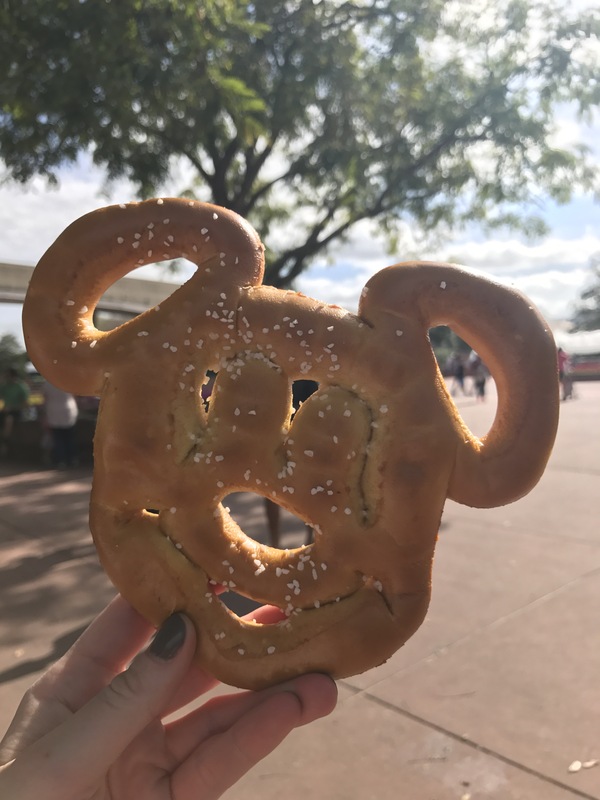 My only complaint about Erin McKenna’s Bakery is that it not more readily available in the parks! 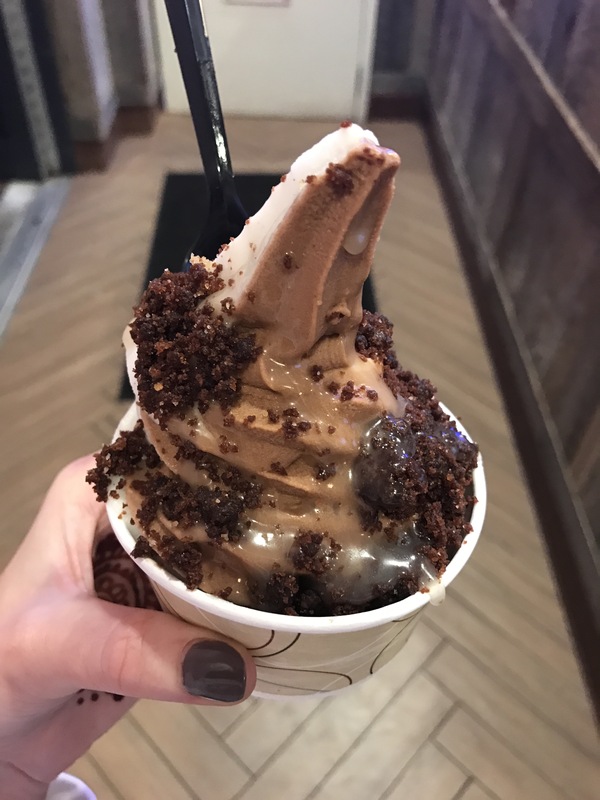 The night we went to Blaze, we ended up getting some cookies and SOFT SERVE for dessert. 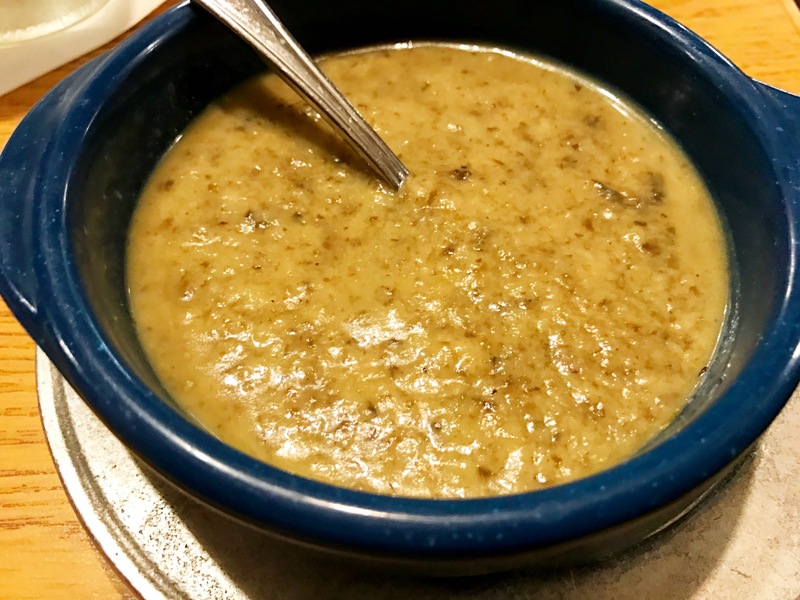 It was perfect, except I would skip the caramel sauce topping, its not that great. 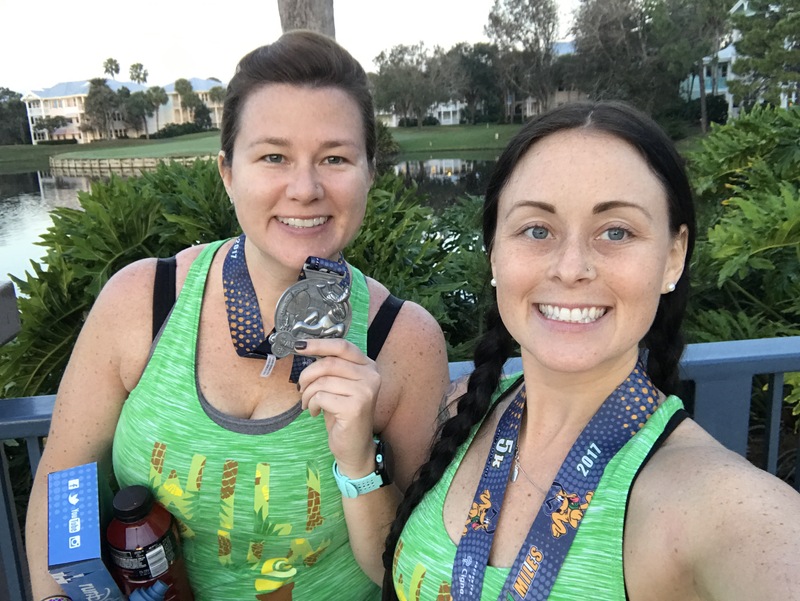 BONUS – Erin McKenna’s offered 10% off your order if did any runDisney race (medal proof) which was very cool in my book. Post marathon with dead legs we decided to eat fancy and with a view at the California Grill in Disney’s Contemporary resort. 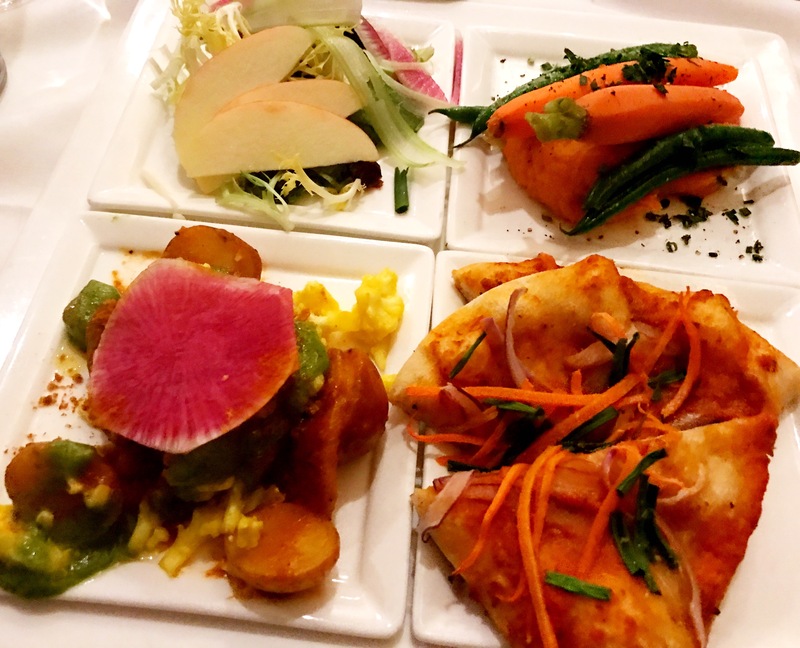 As previously discussed, the chef created a four plate sampling for both me and my friend Natalie. 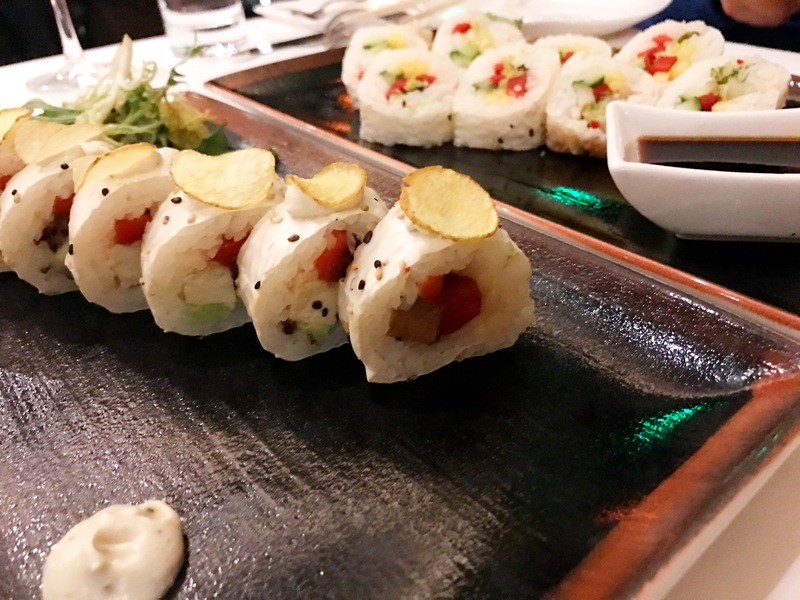 In addition, we had the Truffle Tofu sushi for an appetizer. 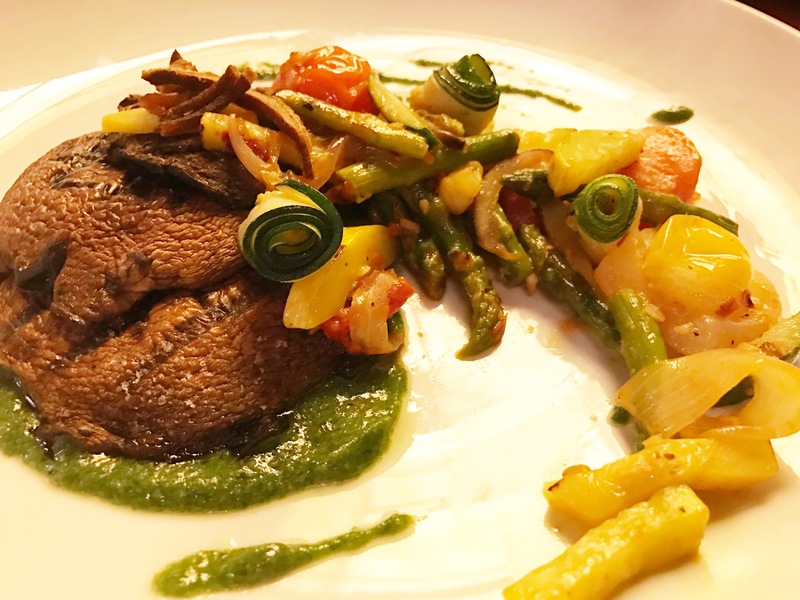 The Turf Club, the little known restaurant at the Saratoga Springs went all out vegan for us. 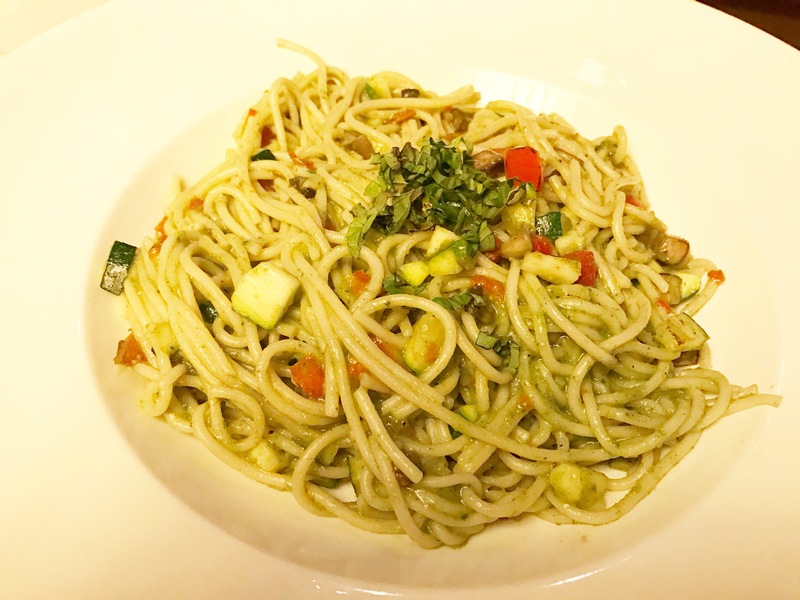 Chef Omar has been all over the Veg Disney plugging his vegan creations at the Turf Club so we thought to give it a try. Chef Katie and Omar treated us very special. 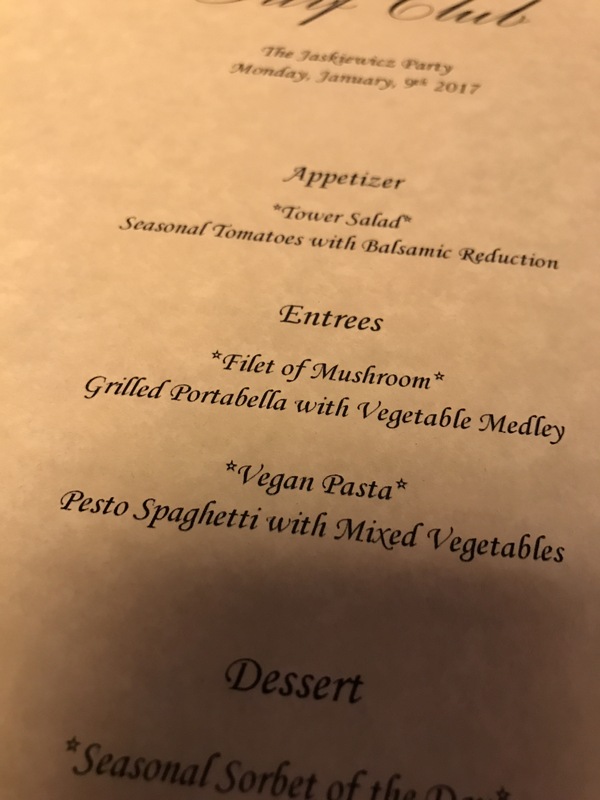 See below personalize menu along with our meals. Popcorn – (Salty Goodness) – Tip: If you are a popcorn lover like myself, buy the souvenir bucket right away. It is worth the extra money. Fill ups are under $2 and are not capped. Since we flew in from Philadelphia and did not have a car when we landed, we did grocery delivery from Garden Grocer. They had lots of vegan friendly items included soy milk, Earth Blance, vegan cream cheese, and fruit. The delivery was on time and they were very good at keeping us up to date. 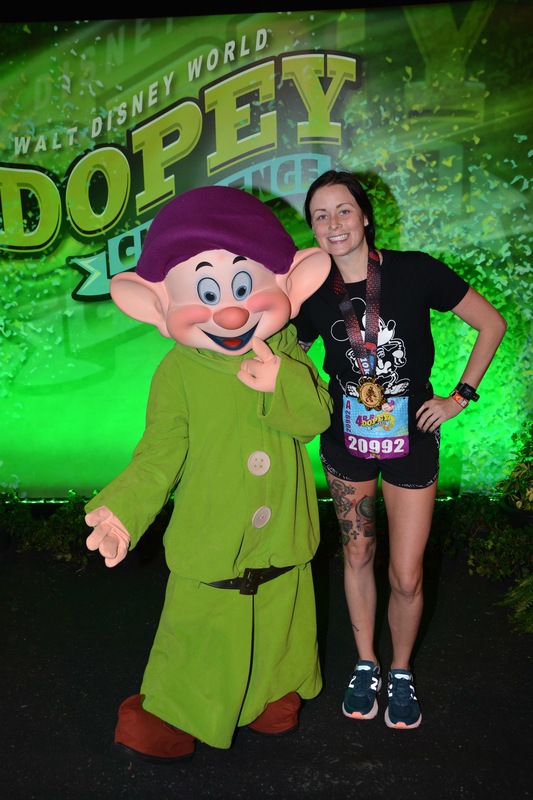 Now onto my thoughts on running the Dopey Challenge. I must begin by saying I did not “race” these events. Since this was my first go at a challenge of this sort, my goal was to finish all of them. Unlike most people who use the Galloway run/walk plan, I did intend to run all 4 races. Going into it, my biggest fear was waking up early. I knew I could do the runs physically but the 3:00 am wake up calls were going to be a new obstacle. Before we talk running, we must touch on the expo for a moment. The Expo was a nightmare. We went on day 1, Wednesday, because it was mandatory for the Dopey challenge participants as the first race would be Thursday. To begin, transportation from the parks to the expo was not available or cast members had no information about it. We ended up taking an Uber from the Contemporary since we were spending our day at Magic Kingdom. The Uber was cheap and we were dropped off right in from of Disney’s Wide World of Sports Complex. In proper Disney fashion, the expo had lines, LONG lines. Bib pick ups were ALL over the place. Challenge, marathon and half marathon were in one building while 5k and 10k were located on a walkway. In addition to this separation, someone thought it would be a genius idea to place the half marathon shirt pick up (for any non-challenge half marathon runners) in the main expo building. The main expo building that had a 1 hour+ line to get into. FUN. We waited in this line, for over an hour. Once inside, it was just like any other marathon expo. Tip: I am not sure if I was so out of the loop or what, but New Balance has Disney themed marathon weekend shoes that were so cool. I knew about these prior to entering the main expo building, what I did not know what you needed an appointment to buy them. They were nice to look at though. 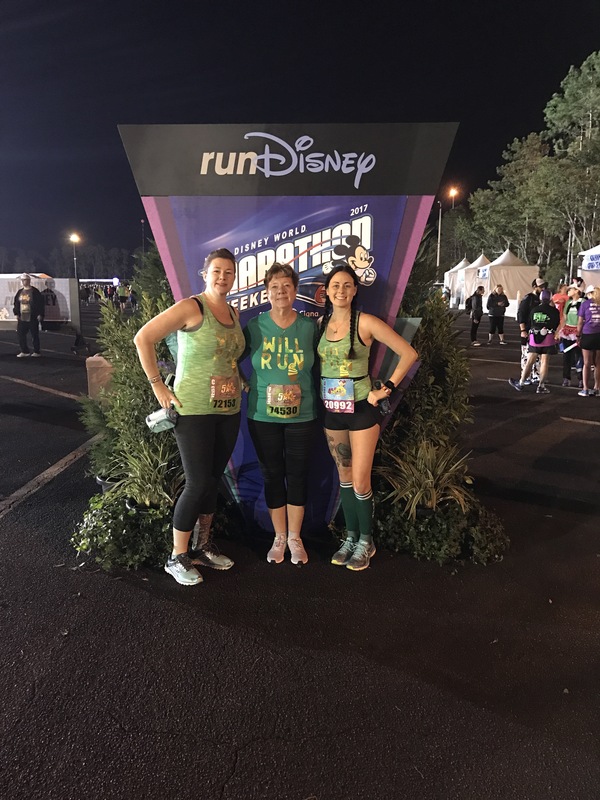 My tip for anyone new to runDisney. Book an appointment prior. Even if you are only thinking about buying the shoes. Better safe than sorry. No Tip: I wish I could provide a good time to go to the Expo so you could avoid the craziness. From what I heard, it is always crazy for the challengers, unless you want to pay extra money to be VIP, but I cannot tell you if that is worth it or not. The race was set to being 6:00 am. I am a nervous racer. Waking up, I was extremely nervous about the transportation to the race. I even had a nightmare about it prior. Do not laugh at me, this was my first runDisney morning race. So my sister, mom and I, in our Raw Threads gear, left for the race 1 hour 30 minutes before the race start time, at 4:30 am. Well… we arrived at the race in in 15 minutes. Turns out, our resort, Old Key West, was VERY close to the start line! We noted this for future races! Arriving early left lots of time for standing around and photo ops. Before each race, the sponsored character (Pluto for the 5k) hung out for official pictures. Along with the sponsored character, there were also chances for pictures with the challenge sponsored characters, Goofy and Dopey. My opinion, arriving early for one race and knocking out all of these photos is smart. As a first time runDisney morning racer, I missed my corral. I had been chatting with my mom and sister, not paying any attention. When I arrive at my corral, it already left. So instead of corral A, I ran with corral C. It was not too bad, crowd wise. The course took you through the Epcot parking lot, through Epcot and ended closely back were it started. As race 1 of 4, I felt great, even after walking all day through the parks Tuesday and Wednesday. My coach Rita, who was on board with my, “finish” goal gave me a plan to run an easy average pace of 8:20 min per mile. As with most races, I felt great, adrenaline was high and the crowd was happy (we were in Disney World, DUH). I ended up averaging 8:01 per mile. I was surprised as I did not feel I was going at that speed, but obviously I was. For this race, I did not stop at any character stops. I feel if I started in corral A, as intended, lines would not have been as long and I could have popped in and out for photos. Post race snacks were vegan friendly. 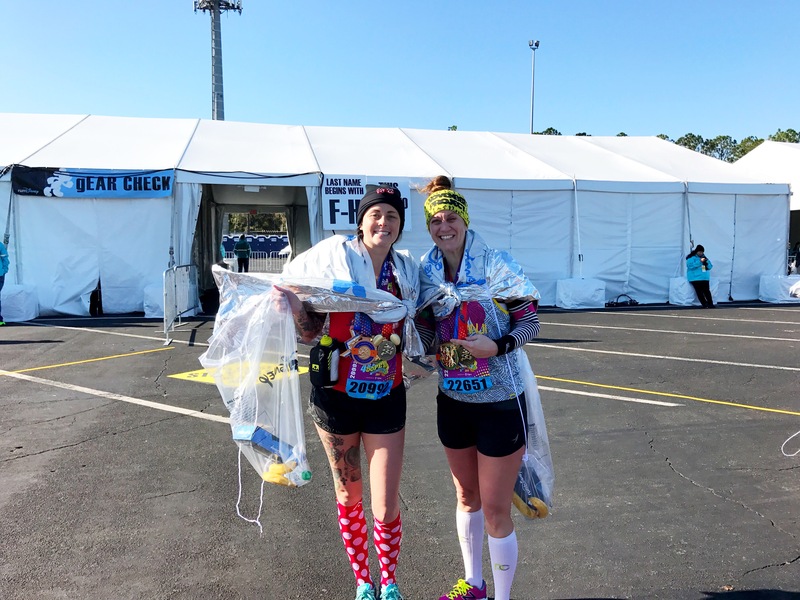 Each race ended with bananas, Powerade, water and a runDisney snack box. The box included tortilla chips, Oreos, a Clif bar and apple sauce. 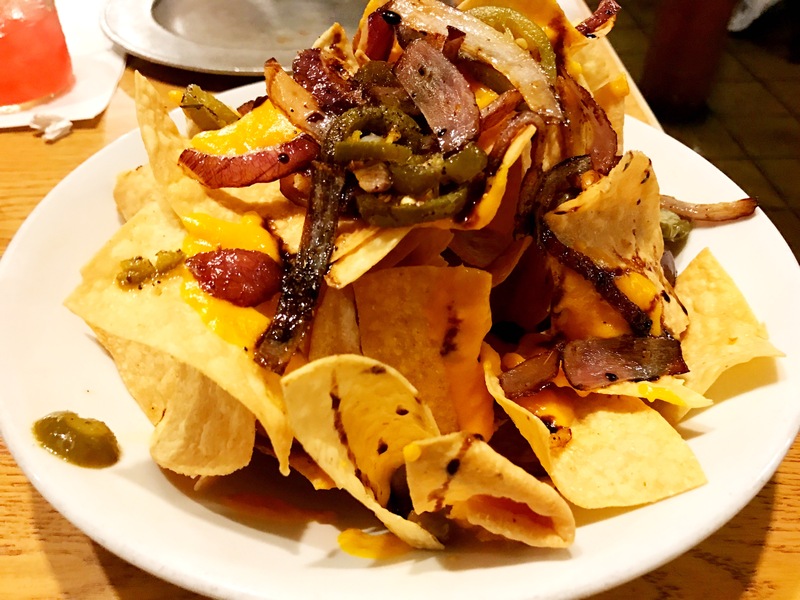 The only non-vegan item was this nasty looking cheese cup which was all the rage among the omnis..
Transportation post race was a little tricky. 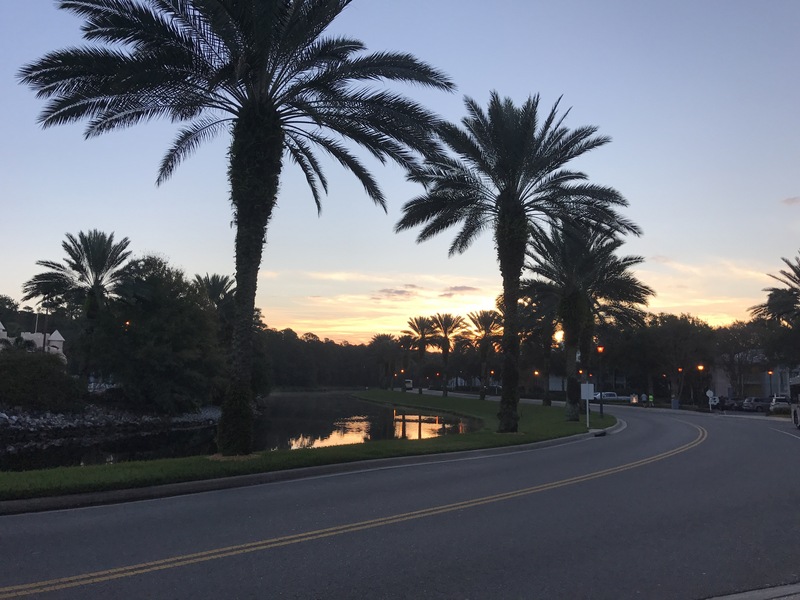 As the course begins in the parking lot, transportation back to the resorts did not begin until every runner passed. Since I started in an early corral and ended in 25 minutes, I had to wait in line for the bus to go back to the resort (where Natalie was waiting for us to go to parks, JK she was still sleeping). I waited so long, my sister,who was a couple corrals back, also finished. We arrived back at the resort just in time for sunrise. My mom, who walked the entire 5k, arrived back at the hotel about 45 minutes after us. We then got ourselves together and headed to Hollywood Studios and Epcot for the day. Day two of running and we knew better. We did not arrive at the race till 4:45 am (for the 5:30) race start. We both got to our corrals on time and we both killed our races. Starting in corral A was pretty awesome. 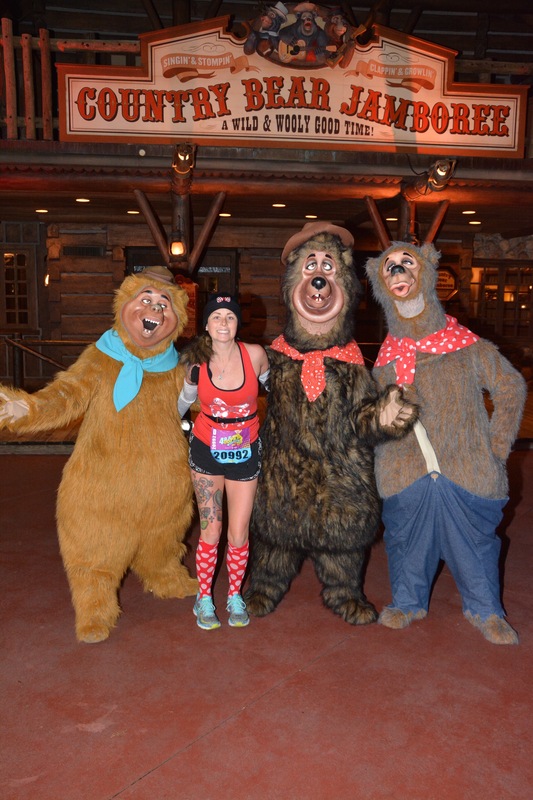 Since this was the first officially timed race (the 5k was only officially timed for Dopey Challengers), many people in corral A were running for time. There was less dodging people in the beginning and there were TWO characters with no, or minimal lines. I got to then stop and see The Genie and Winnie the Pooh & Tigger. 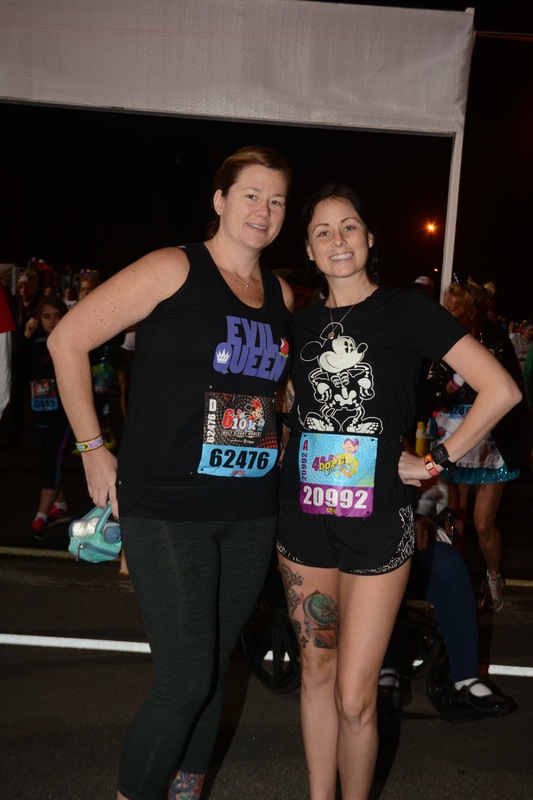 For those new to runDisney, the photographers will take your picture professionally while the character “handler” will take a picture with your phone, if preferred. Rita’s goal for me for this race was another easy 8:35 per mile pace. As I started, my legs felt their first feelings of heavy. I had just trotted the parks for 3 days with no regard of my running and had completed a, faster than planned, 5k the day before. After 1 mile, my legs were back and I enjoyed myself. We ran through the Epcot parking lot, around the Boardwalk resort and into Epcot. It was fun and ended my race only a little faster than planned at 8:19 per mile pace with TWO character stops. Transportation was easier than the 5k from here on out. I was able to hop on the bus after my run, after getting my photo with Dopey of course. Again, there was no rest, we arrived back at the room, got ready and spent the day at the Animal Kingdom. Before getting into race day Saturday, we have to talk about Friday afternoon/night. Saturday’s weather forecast had called for rain all week, no surprise there. 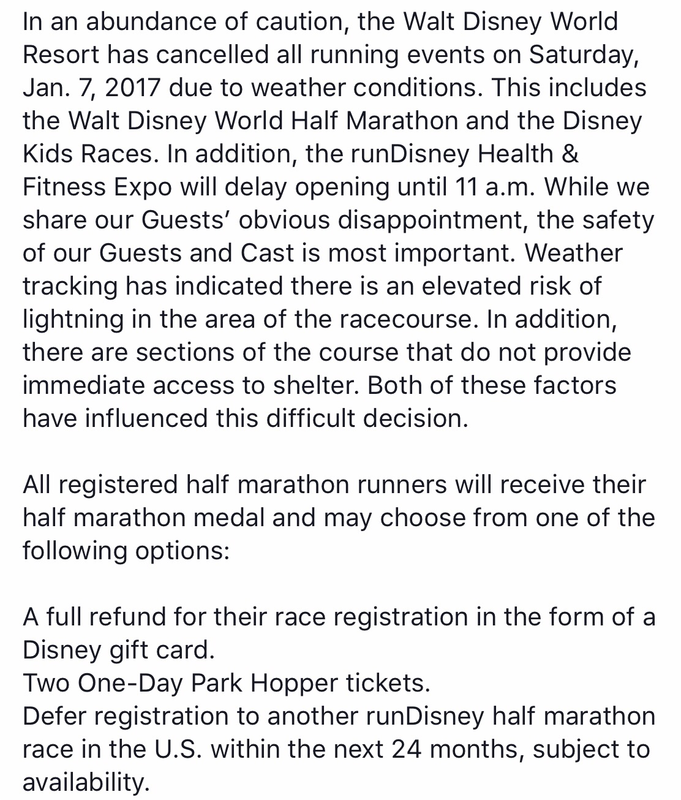 On top of the rain, rumors were swirling on social media about a possible cancellation of the race. The cause of this alarm, lightening. With three people in our group running the half marathon, we kept our eyes peeled for the cancellation email, hoping it would never come. That Friday night, on our way to Blaze Pizza for a proper carboload, we received the following message. That Saturday, I set out with my rain gear, after “sleeping in”, at 7:37 am. 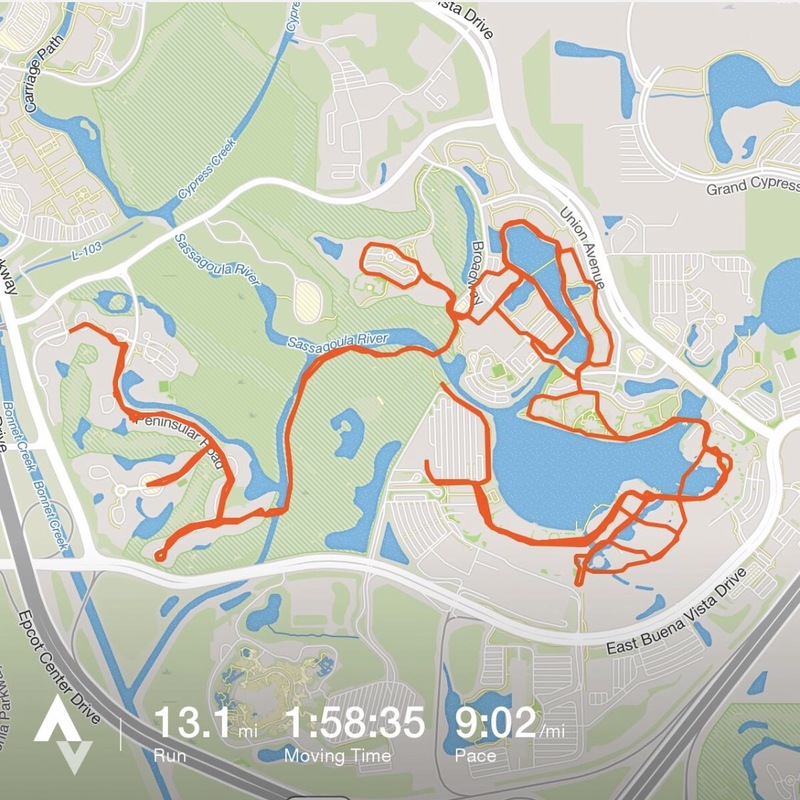 My course took me on multiple loops through Old Key West, Saratoga Springs (the two resorts are connected with a walking path) and Disney Springs. I saw so many people along the way doing their unofficial half marathons as well. It was the best. I feel like I can say I semi-earned my shirt and medal, as all the others runners I saw out there did. Others would disagree, but to each is own. Rita did not give me a plan for this race as I was supposed to pace my sister at about 11:00 min per mile. I ended with a pace of 9:02 min per mile. It felt good. It was raining and warm and my legs were enjoying it. 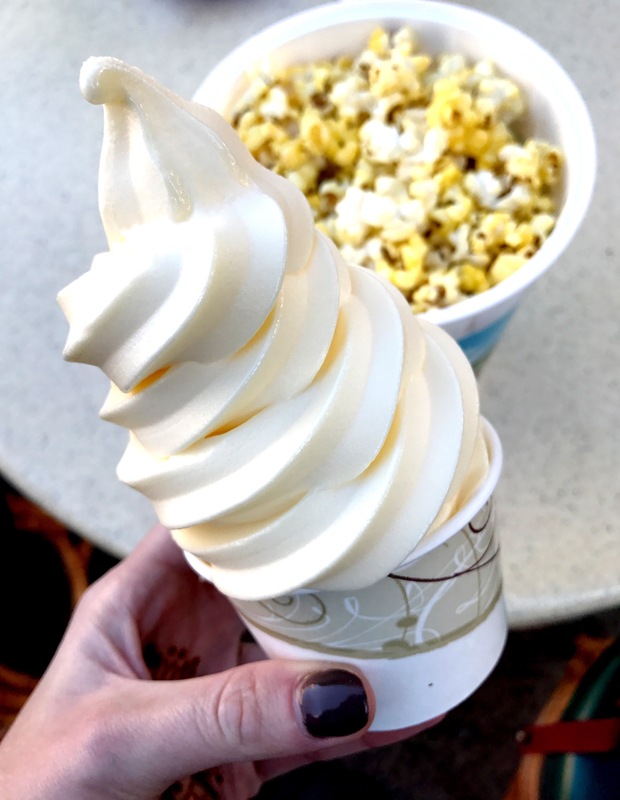 I arrived home to my party actually waiting for me, no snack box in hand though, and I got myself together and we went to Hollywood Studios and Epcot for the day again (even walking from park to park). When I say I did not rest, I meant it. The most sitting I did was on the bus. Feeling like a runDisney race pro at this point, me and Natalie, sort of slept in. I woke up, ate my Clif bar, drank some coffee, packed my Gu’s and we left, around 4:30 am. We arrived at the race start with just enough time to go to the bathroom and get to our corrals. It was cold on this Sunday morning and not many people could handle it. I mean we were in Florida, who would expect the cold. Not the case with me. This was my prime running weather. I was in my shorts and tank top and got all the stares when I took off my trash bag I borrowed from the cleaners at Old Key West. It ended up being the perfect race attire. Rita’s plan for me involved 10 miles at 9:40 min per mile, 10 miles at 9:20 min per mile and a stronger finish. I started off with heavy legs, as I had for the 10k and it was taking me a bit to shake them off. This leads me to my off topic runner complaint. A lot of runners are WAY TO SERIOUS. 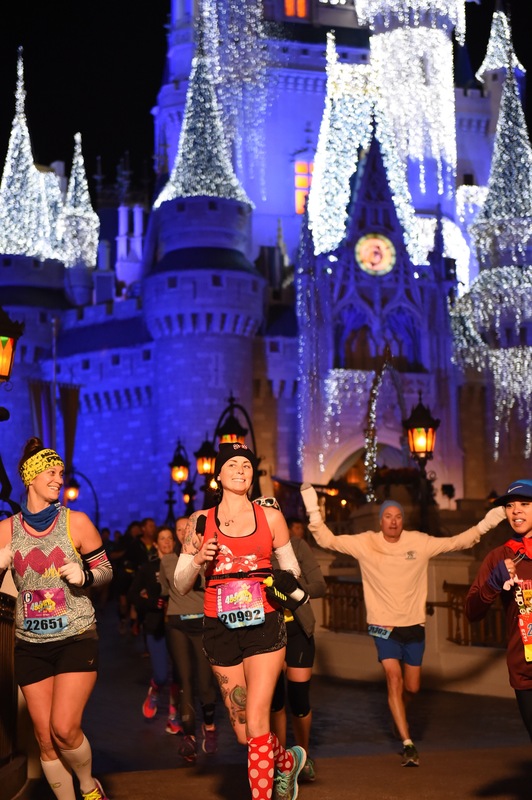 I understand people may have been going for PRs or like super concentrating on their gait but whatever, runners may have been in the happiest place on earth, but they were not happy themselves (further proof of this later). I am the type of runner who LOVES a good chat while on the course. I was chatless for over 2 miles. No one even responded to my cheesy jokes like “25 more to go” at mile 1, until I hear a faint “Erin” over my music that I wasn’t even listening to. It was a friend from home, Suz who I had met 2 years prior at the finish line of my first marathon in Philly. She was the co-leader of the November Project, Philadelphia tribe and we joked how I wanted to go to November Project strictly for the crowd surfing aspect. I eventually starting going to November Project the following year. It was crazy that of all people there we would run into each other. From there on, I ran with her as we chatted the remaining 24 miles about our lives, Twizzlers and concussions. We learned more about each other in those 4 hours than we did in the time since meeting each other combined. It was so nice to have her to chat with and get through the ups and downs of the marathon with. 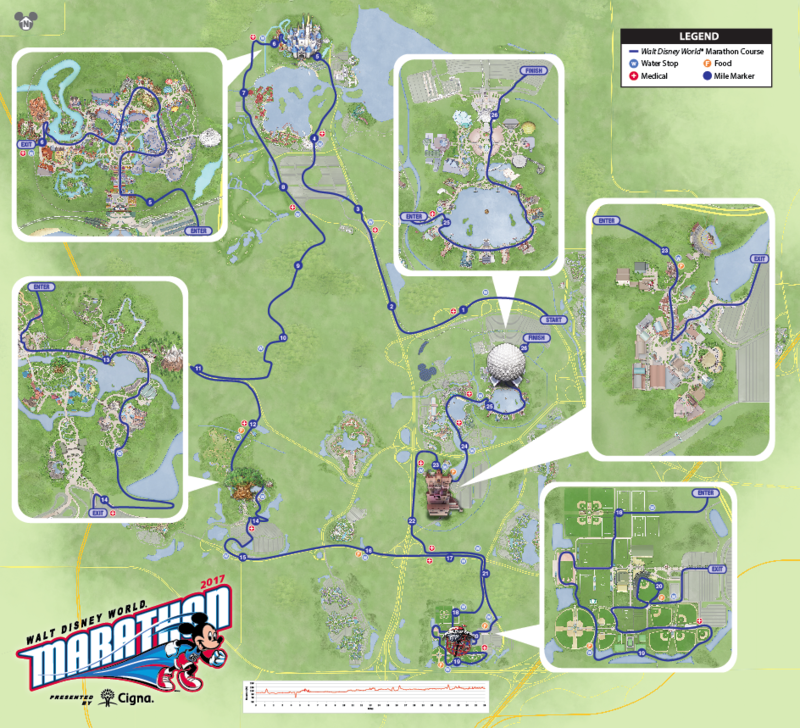 The course weaved through all four parks in addition to the Wide World of Sports complex and ended where it began at Epcot. 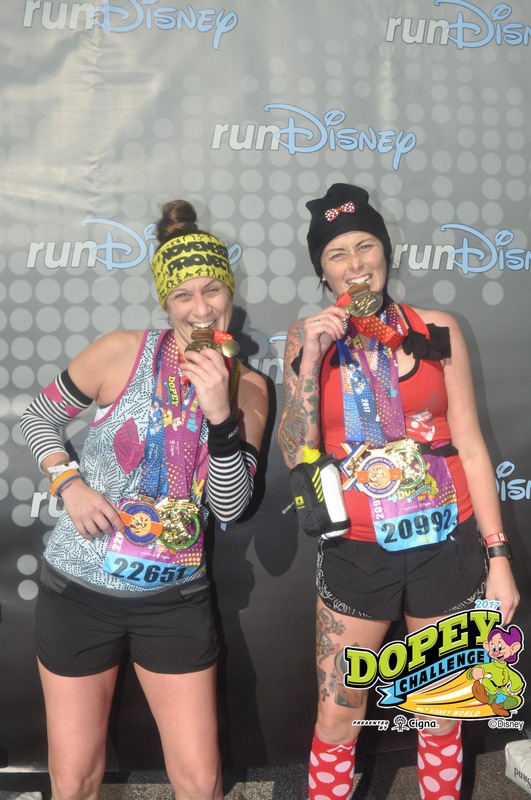 Suz and I ran through the finish line hands held high as we completed the Dopey Challenge. We did not get to ride any rides or get a margarita, we were too early for both, but we did have fun & stop for so many characters along the way. Final race pace was 9:53 per mile pace with about 12 character stops. At the end Suz had to go back to work with Runner’s World and I got to go back to getting the silent treatment from other unhappy marathon runners on the bus. I even offered my cheese cup to everyone around me, crickets. Some people do not run as happy as others, I get that now. Overall, I loved the races and the food. Since I did not officially complete Dopey, I have already signed up again for next year. I will also be back with my sister, Jamie, to run the Wine & Dine half marathon in November.